Twenty years after international airlines such as U.K.-based Virgin Atlantic and Taiwan’s EVA Air introduced the premium economy concept, the section between coach and business class still represents fewer than 4 per cent of seats in the sky, according to a recent Travelport/Carlson Wagonlit study. Meanwhile, U.S. carriers have been far more concerned with basic economy—“economy minus” to some—than its premium counterpart. But for fliers who want roomier seats, better meals, larger entertainment screens, and more personalized service without an extravagant price tag, the options are starting to grow. In the last year, American Airlines Inc. and Delta Air Lines Inc. both rolled out premium economy on international flights while United Airlines has started installing new “Premium Plus” seats aboard a handful of its long-haul jets. Like most premium economy tickets, they tend to cost two to three times as much as coach and half the price of business class. Why the sudden uptick? 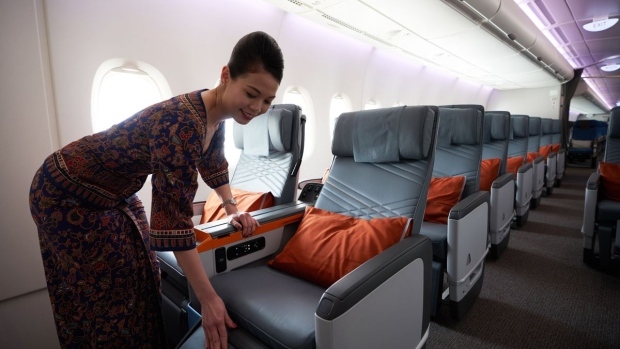 Longer flight routes, such as Singapore Airlines Ltd.’s new flight from its namesake hub to Newark, are making comfort as important as affordability; for that 19-hour flight, the airline decided to nix coach service entirely, including only premium economy and business class seats. “Our premium economy passengers are a mix of leisure travelers on special occasions and business travelers who appreciate the value,” says Phil Capps, head of customer experience at Australian airline Qantas Airways, another carrier noted for its long hauls. Cathay Pacific Airways Ltd.’s senior vice president of the Americas, Philippe Lacamp, agrees. He says these cabins are about making a “trade up” for small business entrepreneurs, not luring executives away from business class. Wherever you fall on that spectrum, here is a ranking of cabins that most warrant the upgrade from coach, based on such factors as seat size, amenities, availability, and *price. Consider it your handbook to flight survival, both for the hectic holiday season and beyond. *Fares cited in this story were the lowest available from January-March 2019. Price difference: On flagship routes, expect markups of 60 per cent to 150 per cent. That’s roughly US$550 more between Singapore and San Francisco (US$893 in coach and US$1,448 in premium), or an additional US$1400 between Singapore and London. Price difference: Fares fluctuate dramatically, depending on the route. Tickets from Detroit to Shanghai started at US$1,047 in economy and US$2,103 in premium economy, while those from Atlanta to Seoul cost US$1,648 in economy and US$2,119 in premium economy. Price difference: Those additional touches can double the price of a round-trip ticket from San Francisco to Hong Kong (US$1,273, vs. US$665 in economy) and add even more to the cost of a flight from Hong Kong to Sydney (US$1,414, vs. $560 in coach). Why it’s better than coach: Everything from check-in to security and boarding is expedited when you’re in premium—including retrieving checked luggage. In addition to three inches of additional width and seven inches more of pitch, you’ll get Casper pillows and blankets, small amenity kits, and meals designed by celebrity chefs such as James Beard Award-winner Maneet Chauhan. Price difference: The upgrade won’t double your fare on major international routes, but it comes close: A round-trip from Dallas to Paris, for example, starts at $555 in economy and US$990 in premium economy. Why it’s better than coach: Air New Zealand Ltd. takes the top prize when it comes to seat size. All are 19.3 inches wide and have 41 to 42 inches of pitch and 9 inches of recline—plus a 5-inch armrest, so you won’t have to wrestle your seatmate for space. That should compensate for the small entertainment screens—a mere 11 inches wide—as should the Kiwi-sourced wines served with dinner. Price difference: Premium economy fares on the airline’s new flights from Auckland to Chicago start at $3,669, while economy fares cost US$1,352. Those from Los Angeles to Auckland start at US$2,619 in premium economy and $899 in coach. This trendsetting airline was one of the first to introduce a premium economy cabin—way back in 1992, when it was called Mid Class. These days, it feels just as fresh. Price difference: A cheap economy flight from New York to London, round-trip, costs as little as US$425; upgrade and it’s upward of US$1,280. The upcharge isn’t quite as steep on other routes, such as London to Johannesburg, where you’ll pay closer to double for premium economy.